TwitterCounter releases a new version of the Widget, a tool to show your latest Twitter visitors in your blog or website and get statistics about them and the pages they visit. These last weeks we have been working on new ways to give you better and more accurate statistics, and now we are proud to present you with an all new version of our Twitter widget. We have updated the interface and look and feel of the widget to make it more appealing to yourself and your visitors and we have included a lot new features to give you a better insight of your site's visitors and the chance to communicate with them more easily. Check out the new widget here: http://twittercounter.com/pages/twitterwidget and get one for your site now! We have tweaked the design and improving the interface, adding a cool scrolling view of all your recent visitors. In the dashboard, you can now see the visitors of your site ordered by date, number of visits or number of followers. You can filter them by followers/non followers/following/not following, too! Get in contact with your visitors the easy way. Communicate with your most loyal visitors directly from the dashboard view. Follow, unfollow or send a DM to all your visitors at once, with one click. Curious about where your Twitter visitors come from? Now you can know how many visitors visited you from different countries and who they are. Go to http://twittercounter.com/pages/twitterwidget and get your widget now! Twitter Counter is a social analytics company headquartered in Amsterdam, The Netherlands. Based on traffic metrics, it is the leading global stats provider for Twitter accounts, providing free statistics over 350 million Twitter accounts. 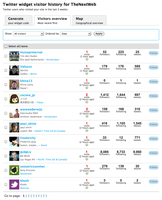 It is also a top tier Twitter marketing tool providing deep Twitter marketing analytics to brands and agencies. Twitter Counter affirms that its service was attacked for what seem to be political reasons. Twitter Counter, one of the prominent analytics services for Twitter marketing professionals, has been hacked and it is believed the attack is part of a wider politically-motivated attack targeting Dutch and German websites and services. The Amsterdam-based company has since apologised in a statement and assures its users that sensitive information have not been compromised. Twitter Counter, the leader in Twitter stats and marketing analytics app, has securely restored its service from the hack experienced last Friday, November 18th, which led to some of its high profile accounts to spam tweets. With nearly 320,000 mentions McDonald's wins the title of the most talked about brand on Twitter during the Super Bowl. This gives McDonald’s a 27% share of the total mentions of brands during the game. Nationwide however, was the brand with the highest social return on investment. The automotive industry was the most represented in terms of commercial airtime with BMW leading the way with 83,000 mentions and an impressive social ROI during the big game. Twitter Counter presents an interactive vizualization of all the Twitter stats from the knockout stage, the semi-finals and the final. Relive your favorite World Cup matches as they unfolded on Twitter and discover who was the most mentioned player and which hashflags dominated. Twitter Counter proudly announces the launch of a brand new browser plugin for Chrome, Firefox and Safari users, promising to forever change the way you tweet. All Twitter users can now get stats on the performance of every tweet in their Twitter feed while getting personalized recommendations on how to improve on their own tweeting.